Safflower (Carthamus tinctorius L.) was originally grown for its flowers, which were used in making red and yellow dyes for clothing and food preparation. Today, safflower is primarily cultivated for its oil, which is used for food and industrial purposes. Safflower is a minor crop with a world production of about 650,000 t in 2009 (FAO, 2010). There are linoleic and oleic types of safflower varieties. The oil in linoleic varieties contains about 70-80% linoleic acid and is used for edible oil products such as salad oils and soft margarines. The oil of oleic varieties contains about 80% oleic acid and serves as a heat-stable cooking oil, or as a drying or semi-drying oil for paints and other surface coatings (GRDC, 2010; Oelke et al., 1992). Several safflower seed products can be used as animal feeds: the seeds, the by-product of oil extraction (safflower meal) and the hulls (Oelke et al., 1992). Safflower seeds are achenes (fruits) surrounded by a thick fibrous hull. They are smooth, shiny and angular, about 6-9 mm long, white or brownish and white with grey, brown or black stripes. They generally contain 33-60% hull and 40-67% kernel. Thin-hulled varieties have been developed (Baümler et al., 2006; Mündel et al., 2004; Ecoport, 2010; Oyen et al., 2007). Whole safflower seeds are mainly used for pet food, either as birdseeds for wild birds, racing pigeons, parrots and other pet birds, or for pet mammals such as gerbils, hamsters and chinchillas. Safflower seeds are normally too expensive to be used as a feed ingredient for farm animals (Oelke et al., 1992; Mündel et al., 2004). Safflower seeds may also be included in pelleted products as they reduce dust in the hammer-mill and give a product that binds readily and will be totally eaten (Dajue et al., 1996). Safflower seeds used for oil production may be either cold pressed, expeller pressed or solvent extracted (GRDC, 2010). The by-product, safflower meal, is mostly used as a protein ingredient for animal feeding. Dehulling improves crushing efficiency, but the hardness of the seed coat and the extreme softness of the kernel make the operation costly and only economically viable if there is a market for hulls (GRDC, 2010; Smith, 1996). High-protein meals containing more than 40% protein can be obtained by sifting the regular meal and removing hull fragments (Alvarez-Gonzalez et al., 2007). The quality of safflower meal is highly variable as it depends on the amount of hulls and on the extent of oil extraction. The hulls may be used in potting mixtures for plant nurseries, to make packing and insulation materials, and as filler for bricks (Oyen et al., 2007). As a feedstuff, they are unpalatable, reduce gain, and can constitute only a small part of the roughage requirement (Göhl, 1982). 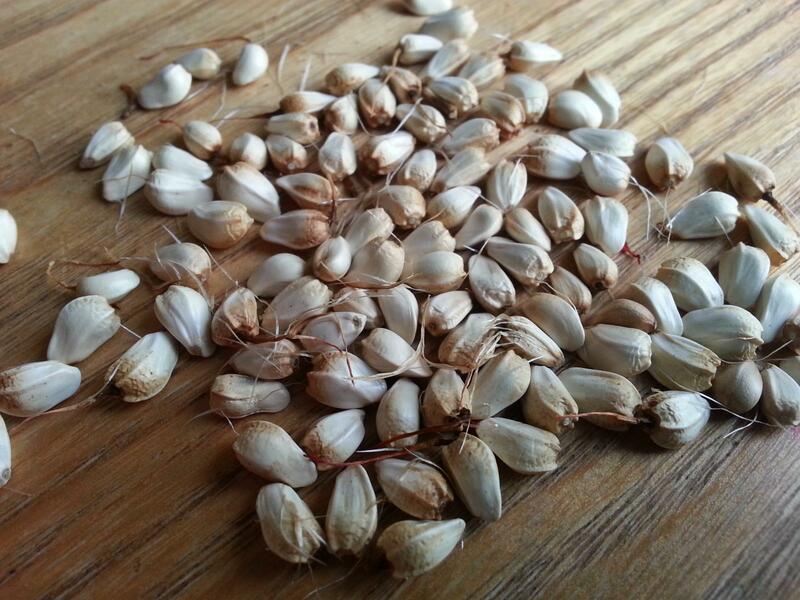 Safflower seeds and their by-products are exported worldwide. The five main producers are India, USA, Mexico, Argentina and Kazakhstan (FAO, 2011). Safflower seeds from a worldwide collection of accessions contained 28.3 ± 4.5% oil and 17.5 ± 1.8% protein (DM basis) (Li Gajue et al., 1993). Seeds contain a high percentage of hull (about 45%), which hampers their use in animal feeding (Hertrampf et al., 2000). The value of safflower oil meal depends on the process. Oil content varies from 1% for solvent-extracted meals to 15% for those mechanically extracted. Protein content is about 20-25% in the undecorticated meal but can be over 40% in decorticated meals (Dajue et al., 1996; Göhl, 1982). Crude fibre content is about 30-40% for undecorticated meal and can be as low as 10% in the dehulled meal (GRDC, 2010). When compared to soybean meal, the quality of safflower protein for monogastric feeding is low due to its deficiency in lysine, methionine and isoleucine coupled with the low availability of these amino acids (Darroch, 1990). Safflower meal is an excellent source of P, and a good source of Zn and Fe (Gowda et al., 2004). It contains 3.5 times more Fe than soybean meal. Its vitamin profile is poorer than that of other oilseed meals, but it is a good source of biotin, riboflavin and niacin relative to soybean meal (Darroch, 1990). Hulls contain about 60% crude fibre and 21% lignin (Hertrampf et al., 2000). The protein fraction of the meal contains two phenolic glucosides, the bitter-flavoured matairesinol-β-glucoside and the purgative 2-hydroxyarctiin-β-glucoside. They can be removed by extraction with water or methanol, by the addition of β-glucosidase (Darroch, 1990), or by a combination of physical and enzymatic treatments (Jin et al., 2010). Undecorticated safflower meal can be used in ruminant rations as a protein source, as a replacement for soybean meal, cottonseed meal or linseed meal, if used on an isonitrogenous basis and if adequate energy is supplied (Kohler et al., 1965). When high levels of safflower meal are included in ruminant diets, lower performances have been observed (Walker, 2006). Safflower meal is slightly bitter and less palatable than other common ingredients (Smith, 1996). However, its palatability is variable and it may be readily eaten by ruminants when mixed with other feeds (Göhl, 1982). Early trials in the 1950s and 1960s showed that sometimes it presented palatability problems with beef cattle but that dairy cows found it palatable (Smith, 1996). Safflower meal was palatable and well accepted when fed to rams (Sudhamayee et al., 2004). Undecorticated safflower meal has a low in vivo digestibility in ruminants, but its in vitro digestibility value is equal to that of sunflower meal (Chandrasekharaiah et al., 2002). The in vivo OM digestibility was about 45% (calculated from Dixon et al., 2003a), with a ratio of 0.60 or 0.70 when compared to barley or linseed meal respectively. It provides less energy than soybean meal, sunflower meal, rapeseed meal and cotton meal, due of its high fibre content (Walker, 2006). The OM digestibility of decorticated safflower meal was found to be much higher (68%) (Goss et al., 1954). Safflower meal is reported to have a highly degradable protein (Walli, 2005), though it is less degradable than that of groundnut meal (Sudhamayee et al., 2005). Only few values are given in the literature for protein degradability: it varied between 60%, with a ratio of 0.90 or 1.16 when compared to rapeseed meal or soybean meal respectively (Chandrasekharaiah et al., 2001), and 70%, with a ratio of 1.16 when compared to linseed meal (Dixon et al., 2003a). Safflower meal is a poorer source of protein than groundnut meal, due to its lower digestibility and lower nitrogen retention (Sudhamayee et al., 2004). Past research has shown safflower meal to be a valuable ingredient for dairy cows, with no noticeable effect on flavour or odour of milk produced. It was a good substitute to linseed meal for instance (Smith, 1996). Adding 1 kg of safflower meal in the rations of dairy cows increased milk yield and milk fat and the substitution of 1 kg of concentrate by similar amount of safflower meal gave similar results (Juknevicius et al., 2005). With low-producing Friesian cows and buffaloes (less than 10 kg milk/d), 3.75 kg of safflower meal successfully replaced 3 kg of undecorticated cottonseed oil meal, and slightly increased milk fat content (El-Shinnawy et al., 1979). Most of the research concerning the use of safflower meal in beef cattle was done in the USA before the 1960s. Steers fed expeller safflower meal or linseed meal had similar live-weight gains. Comparisons with soybean meal were satisfying only when safflower meal was fed at low amounts (Smith, 1996). In wheat silage rations for steers (285 kg BW), inclusion of safflower meal in compound feed at 18 and 35% in the diet had no adverse effect on feed intake and feed palatability, and resulted in an average daily gain of more than 1.4 kg/d (Voicu et al., 2009). In young sheep rations based on low quality grass hay or cereal straw, supplementation with safflower meal gave higher live-weight gains and increased wool growth more than a barley/urea supplement (Dixon et al., 2003a; Dixon et al., 2003b). In hay-fed lambs (18 kg BW), adding 350 g/day of concentrate mix with 25% safflower meal resulted in an improvement of intake, digestibility, feed efficiency and body weight gain (Dessie et al., 2010). Safflower seeds are less palatable than other common oilseeds. Whole safflower seeds can be fed to beef cattle without processing. Due to their fibre content, higher levels of safflower seeds in the diet can result in lower animal performance. The maximum inclusion rate for safflower seeds is 1.1 kg/cow/d (Walker, 2006). The incorporation of safflower hulls in cattle rations lead to a reduction of feed efficiency because of their low digestibility, but growth is not impaired when adequate energy and protein are supplied by other sources. Safflower hulls are used to provide bulk in high grain rations for beef cattle (Kohler et al., 1965). Safflower meal is not a very suitable feed for pigs. The protein quality is low due to its deficiency in essential amino acids. Undecorticated meals are not usable by pigs due to their excessive fibre content (Williams et al., 1973; Darroch, 1990). Decortication improves the nutritional value of the safflower meal for pigs. Feeding safflower meal to weanling pigs or pigs weighing less than 45 kg is not recommended (Chiba, 2001). Dehulled safflower meal is usable for grower-finisher pigs, but only when supplemented with a protein source rich in lysine. Up to 12% safflower meal can be included in the diet if the lysine requirement is met (Darroch, 1990). It has been suggested that safflower meal should not provide more than 5 to 10% or 12.5% of the supplementary protein in the diet (Chiba, 2001). Feeding growing pigs (20 to 80 kg) with a diet containing 17% of decorticated safflower meal reduced growth and increased carcass fatness. Addition of lysine resulted in a small increase of performance but results were still lower than those obtained with soybean meal or fish meal supplements (Williams et al., 1973). Finisher female pigs fed diets containing safflower meal and supplemented with amino acids had a reduced growth. A small increase was observed when the safflower meal diet was supplemented with fish meal instead of lysine and methionine (Williams et al., 1974). Dehulled safflower meal can be included at up to 15% in the diet of pregnant sows, but it should be limited to very low levels for lactating sows (Darroch, 1990). Due to their very high fibre content, safflower seeds and undecorticated safflower meal are of low value to poultry (Kohler et al., 1965). However, partial or total dehulling, associated with appropriate feed formulation, can enable the use of safflower products in poultry. The use of decorticated safflower is possible in poultry diets if the energy level is adjusted, with a special care to lysine and methionine supplementation. Recommended inclusion levels are lower for young birds (5-8%) than for older broilers and hens (10-15%). Safflower seeds can be safely included in broiler and layer diets at a 10% level. As safflower meal does not appear to show toxicity, these levels can be extended in the context of less intensive production, but it is advised not to do so without supplementing the diet with other protein sources or amino acids. The extent of the dehulling process has direct consequences on the value of safflower meal. A complete dehulling resulted in a meal with a crude fibre content as low as 2.4% while partial dehulling left 10 to 15% crude fibre, resulting in a reduction of metabolizable energy of 25% (Farran et al., 2010). The energy value also varies with the type of animals: ME was found to be much higher (8.9 vs. 5.4 MJ/kg) in hens than in chicks (Petersen et al., 1976). Similarly, a comparison between young and older turkeys showed a 30% difference in ME (Halloran et al., 1973). Digestibility of proteins and amino acids increased with dehulling and was comparable to that of soybean meal for fully decorticated and extruded safflower meal (Farran et al., 2010). Growth performance can be similar to control treatments (generally soybean meal/maize grain diets) if the diets are supplemented with appropriate levels of potentially limiting amino acids. For example, up to 22% dehulled safflower meal maintained growth in broilers when lysine was added, while unsupplemented diets almost halved the rate of gain (Mohan et al., 1984). However, a 30% inclusion rate led to reduced growth even with lysine supplementation. Poor growth and problems of beak pasting at very high levels of safflower meals were reported by Ramana-Rao et al., 1971. Dehulled safflower meal was also efficiently used in pullets when lysine and methionine were added (Wylie et al., 1972). Some studies reported that it is possible to maintain broiler performance with undecorticated safflower meal using iso-energetic diets, but this requires expensive energy sources to supplement the diet, such as high levels of fat (more than 10% in the experiment conducted by Thomas et al., 1983). In broilers, full fat safflower seeds have been tested at levels up to 20% in diets where energy and protein were adjusted. Seeds have the advantage of providing more energy than safflower meal. In this study growth performance and carcass traits were not affected; only blood cholesterol was significantly decreased (Malakian et al., 2011). When up to 10% safflower seeds were tested in layer diets, there was a trend for slightly decreased performance although this effect was not significant (Hosseini-Vashan et al., 2008a). In similar trial, inclusion of safflower seeds in the diet induced changes in the fatty acid composition of yolks, in particular an increase in linoleic acid (Hosseini-Vashan et al., 2008b). Safflower seeds are often used as birdseed especially for members of the parrot family and pigeons. They are a common alternative to sunflower seeds. 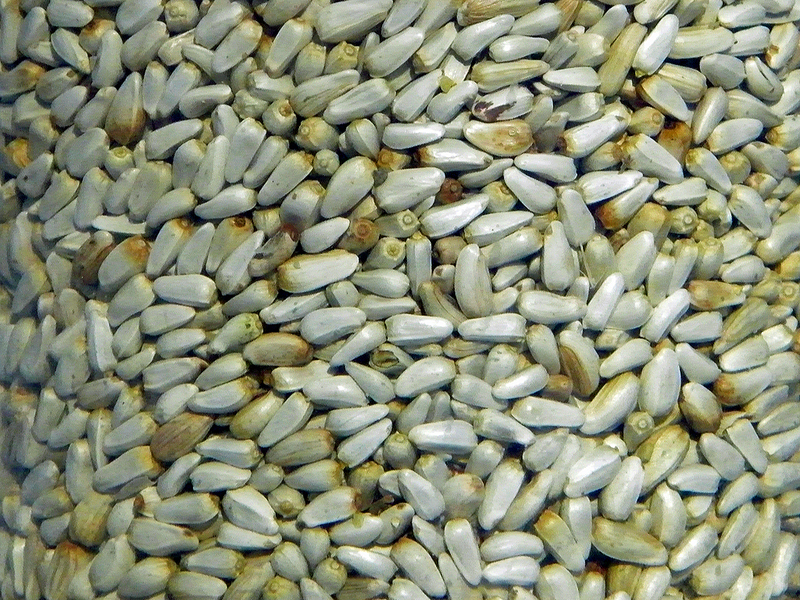 The bird feed industry prefers to use white hull and normal hull types of safflower seeds rather than striped types (Emongor, 2010). Extruded safflower seeds (3 F extruder - 123°C) introduced at 33.8% in the diet (50% sun-cured alfalfa meal), resulted in a milk production (measured by weight of kits at 3 weeks) and a young growth rate (at 8 weeks) similar to those obtained with the control diet (alfalfa and soybean meal) (Johnston et al., 1985). Safflower meal included at 60% in the diet (replacing entirely sun-cured alfalfa meal) resulted in a milk production (measured by weight of kits at 3 weeks) and a young growth rate (at 8 weeks) similar to those obtained with the control diet (Harris et al., 1980). In Mexico, safflower production was particularly important during the late 1970s (FAO, 2011), and standard and dehulled local safflower meal (pasta de cártamo) were extensively used in rabbit feeds in place of imported soybean meal (Lebas, 1981). Due to their high fibre content, safflower seeds and safflower oil meal are not very good ingredients for fish. Only partially dehulled or fully dehulled safflower meal should be used. It should be avoided in starter and grower feeds, and fed to herbivorous and omnivorous fish rather than to carnivorous ones. Safflower meal should be included at a maximum rate of 5-7%, and lysine and methione supplementation is required (Hertrampf et al., 2000). In California, during the late 1950s and 1960s, a commercial company studied pelleted feeds based on dehulled safflower meal (42% protein) to feed trout. The pellets were palatable to the fish, but resulted in a lower performance than pellets made from less fibrous ingredients and the market never developed. Japanese fish farms used safflower meal regularly in the 1960s and 1970s, employing both non-dehulled and dehulled safflower meal as fillers at less than 5% inclusion rate in the diet (Smith, 1996). In an experiment in India, carp fed a diet based on pelleted safflower meal had better growth than those fed natural fish food organisms and conventional fish feed. Water quality and proximate composition of fish flesh were similar (Nagaraj et al., 1990). In tilapia fed high-protein or low-protein safflower meal, protein digestibility of the diets was higher than for the control diet, but final weight and total length of tilapia were lower (Alvarez-Gonzalez et al., 2007). While the high amounts of fibre contained in safflower meal should make it unsuitable for crustacean feeds (Hertrampf et al., 2000), a series of trials with shrimps have shown that safflower meal, and particularly high-protein ones, can be an economic alternative to soybean meal, fish meals and cereal-based ingredients (Galicia-Gonzalez et al., 2010). In whiteleg shrimp (Litopenaeus vannamei), whole seeds were found to be unsuitable for shrimp diets due to their low protein and high fibre contents (Galicia-Gonzalez et al., 2010). However, high-protein safflower meal can totally replace soybean meal and up to 66% of the protein from fish meal in the diet, without having adverse effects on juvenile shrimp growth or feed utilization (Galicia-Gonzalez et al., 2008). In diets containing 30% safflower products, apparent DM digestibilities of low-protein and high-protein safflower meals were 48% and 52% respectively, similar to those reported for other ingredients such as maize grain or cottonseed meal. Apparent protein digestibility was high (72-89%) (Galicia-Gonzalez et al., 2010).